With the relocation of the US embassy to the area, directly across the river from Pimlico, and the nearby regeneration of Battersea Power Station, Embassy Gardens is the centrepiece of the last great new district in the centre of London. It set record sales values during phase 1, and the second phase is set to deliver even further value growth. The project as a whole will include up to 1,750 new homes and over 20,000 sq m of office and flexible workspace spread over eight building plots rising up to 23 storeys in height. One Embassy Gardens will be the flagship commercial building to complete in 2019, a 215,000 sq ft office building designed by Lee Polisano of PLP Architects. 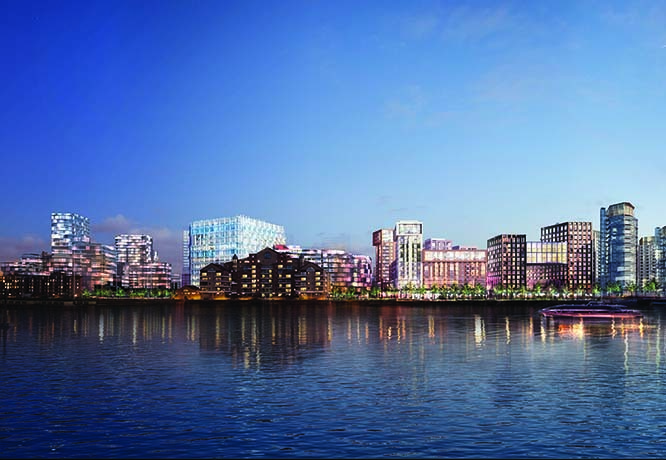 It will have exceptional commercial space over ten floors and a unique west facing roof terrace and winter gardens with spectacular views over the River Thames and central London. New tenants include Penguin Random House UK and Dorling Kindersley.